Eases digestive complaints, reduces intestinal gas,diarrhea, and soothes digestive tract especially in cases of nervous excitability in cats and dogs. Recipe Instructions: Herbal Tea :For a strong, bitter tea to help digestion, steep chamomile for 20 minutes or longer. 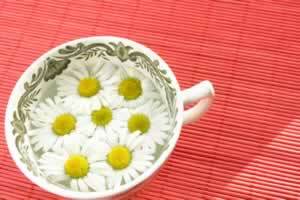 For a gentler, relaxing tea, infuse the flowers for five to ten minutes. Use dried organic bulk flowers, the taste and effectiveness is much better than that of pre-made tea bags, and is a fraction of the cost. For puffy eyes apply a poultice of strong, cooled tea. Lay down, relax and close your eyes. Let the tea bathe your eyelids . Gastritis/ulcer :Gastritis is an inflammation of the stomach lining.